The Canning Doctor: When Will the House Stop Smelling Like Lobster? When Will the House Stop Smelling Like Lobster? 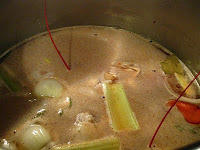 This morning I pulled the lobster stock back out of the fridge and started heating it up again. I put some pint jars in the boiling water canner to warm them, and got the pressure canner set up. So far so good. But there was a LOT of stock. 14 pints worth, to be exact. So I had to do 2 batches of jar warming, but fortunately 14 pints is the maximum I can put in the pressure canner so that part is being done in one batch. The mystery of the day is, how long to process? Beef and chicken stocks are 20 minutes for pints. I read on line that fish stock is 30 minutes for pints. But nowhere can I find a time for lobster stock. I'm worried about not processing long enough. I guess I am thinking that 40 minutes is a good idea. One little observation - my lobster pot always looked huge next to my regular pots. But it looks downright tiny next to the pressure canner.